Attention archivists! 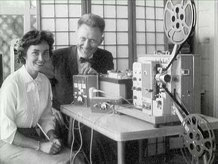 The National Film Preservation Foundation has just announced its 2017 federally funded grants, made possible by the Library of Congress Sound Recording and Film Preservation Programs Reauthorization Act of 2016. The NFPF offers two types of federal cash grants that support the preservation of historically and culturally significant American “orphan” films. The registration deadline for both is Friday, January 27, 2017. Completed applications are due Friday, February 24, 2017. Basic Preservation Grants fund laboratory work to create preservation masters and access copies, and are open to nonprofit and public institutions in the United States that provide public access to their film collections. Awards range from $1,000 to $18,000. Matching Grants help experienced institutions undertake larger-scale projects; applicants may request cash stipends of between $18,001 and $40,000 to fund laboratory work. They must “match” the NFPF grant with outside cash support equal to one-fifth of the award. Eligible to apply are institutions that have successfully completed at least one NFPF-funded project. If your institution has a project that fit our grant guidelines, we encourage you to apply. And if your archive is new to film preservation, we will be happy to answer your questions and guide you through the application process.